The life cycle of a gTLD domain such as .com or .net is different to .au domain names. For a gTLD, you first check if it’s available, then you’ll register it for a period of 1-10 years depending on what you prefer. Once your registration period expires, you will then need to renew the domain name. 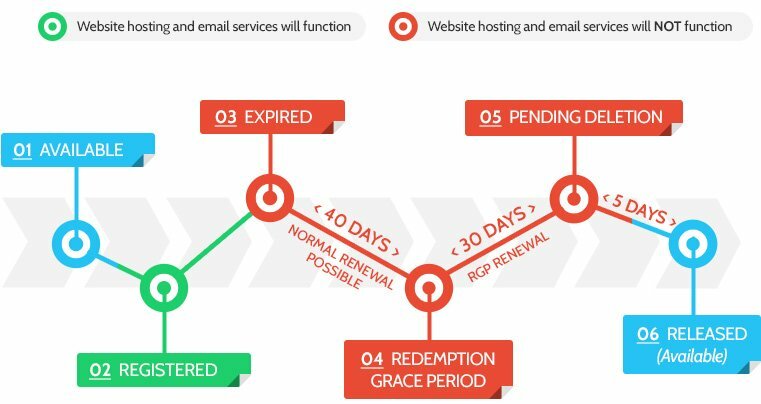 If you fail to renew the domain name, you have 40 days in which you can renew it at the standard price before it enters the Redemption Grace Period (RGP). If it enters this period, you have 30 days to renew the domain at an inflated cost set by the registry operator, which is usually $120 (restore fee) + the domain’s yearly renewal. After this period in time, if you still haven’t renewed it during the RGP, then it will go into a deletion period of 1-5 days. When the domain name is then deleted, it is available for registration at the normal price once more. A detailed flow chart shows the process below.